Is your four-legged friend more sheep than dog? Do they munch their way around the park or stop on the verge for a quick nibble of the green stuff? 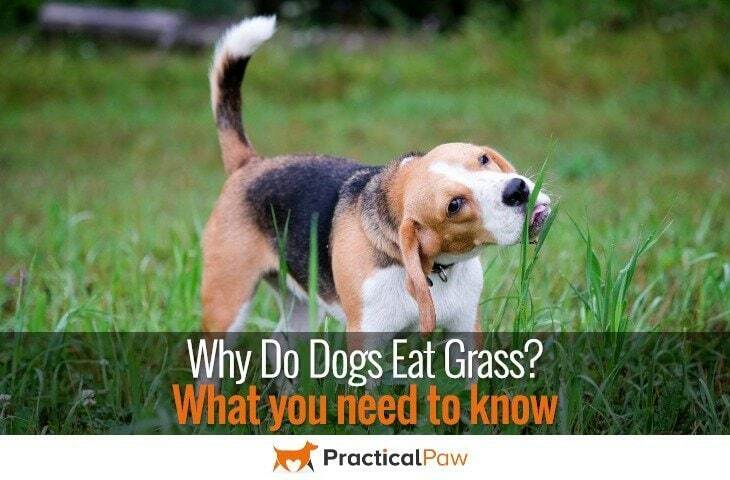 Have you ever wondered why do dogs eat grass? Many owners are puzzled or concerned by their dog’s desire to eat grass. Especially when it can result in vomiting. But not all dogs are partial to the green stuff, which makes it even more baffling! So why do certain dogs like to sample the greenery while others don’t? No one really knows. There are various theories. But the truth is that the dog community can only speculate as to why some dogs do, and some dogs don’t. Although it may seem strange to us, experts agree that eating grass is normal behaviour for our canine friends. And as such we shouldn’t be too concerned. Despite what we may think, our dogs are not true carnivores. Of course,they may prefer a diet consisting mostly of meat, but they are actually omnivores. As scavengers, our dogs eat almost anything. Certainly, meat if they can find it, but also vegetables, fruits, berries and grass. While some dogs are not fussy eaters and will munch on any grass, there are others who choose their greenery with great care. No one seems to know why some dogs are selective about their greenery and others are not. But it appears that not all grass is created equal for some of our canine companions. There is a prevailing view that our dogs eat grass to self-medicate. As dogs lack the necessary enzymes to digest grass, it is thought that they eat it to induce vomiting and purge the contents of their stomachs. As a result, it’s speculated that this purging reduces bloating and any discomfort felt by the dog. Despite this widespread theory, there is little evidence to support it. Less than 25% of dogs are sick after ingesting grass. What’s more, only 10% of dogs showed any indication of illness beforehand. However, if your dog is under the weather and has recently started to eat grass, do take them to your Veterinarian for a check-up. Bored dogs can find any number of ways to entertain themselves. It’s thought that eating grass is just one of them. When a dog is left alone for extended periods of time without mental or physical stimulation,they will find ways to help alleviate their boredom. Since eating grass appears to be harmless, it often goes unnoticed as a ‘problem’ behaviour. Whereas, other behaviours like digging or chewing are more obviously problematic. However, dogs can also suffer a form of OCD. Dogs with OCD perform normal behaviours but do it excessively or in a disturbingly recurrent way. So, if your dog is regularly eating grass when left alone, engage them in another activity instead, i.e. games, walks or offer them toys. If this stops or reduces the amount or time that your dog spends eating the lawn, then boredom is the likely culprit. And providing additional entertainment like a toy or interactive feeder when left alone is an easy fix. But if you are unsure if your dog’s grass eating is problem behaviour, or you think your dog’s grass eating is obsessive. Do visit your Vet who can put you in touch with a behaviourist that can work with you to minimise the behaviour. Dogs may not gain any real nutritional advantage from eating grass as they can’t digest it. However, the nutritional deficiency theory suggests that grass may provide much-needed fibre for dogs that are not getting enough in their current diet. One study of a miniature poodle showed that when a high-fibre diet was substituted for the Poodles normal food, the dog stopped eating grass completely. Although this study was small, it does show that diet plays a significant role in the overall health and behaviour of your dog. It’s thought that our dog’s ancestors ate grass and dirt to help purge intestinal parasites. What’s more, our dogs are not the only animals to do this. Chimpanzees are known to eat leaves and plants of little nutritional value to do the same. Research seems to support this view. As grass has been found in eleven to forty-seven percent of droppings left by wolves. Since our dogs can not digest the grass, it passes wholly through the intestinal tract. Not only does this increase intestinal contractions but also, because of its fibrous nature it traps worms and nematodes and removes them from the body. We can only guess. There is no definitive answer to what is one of the most puzzling and frequently asked aspects of our dog’s behaviour. Even though they may not get much nutritional value from eating grass, a survey shows that it is the most commonly eaten plant by our dogs. So should we worry about it? Although grass is harmless to dogs and is part of normal dog behaviour, do be careful. Even though you may know what you put on your lawn, there may be herbicides and pesticides used in public places that are harmful to your dog. If in doubt, attract your dog’s attention (toys and treats can come in handy!) and move them on. But unless you have a particular concern or your dog is eating grass excessively, there isn’t any need to stop them from having a nibble. Whatever the reason, our dogs seem to get a lot of enjoyment from eating a dewy blade or two. So why not see if you help your dog find their favourite flavour og grass blade. In the short video below, Dr. Patty Kuhly, a vet from vetstreet.com talks through some practical steps you can take to check your pet’s health and behaviour. These include behavioural, medical, nutritional and ideopathic reasons; as well as the need to employ common sense!